Achieve new levels of performance with a whole new kind of inkjet. High Fusion Inks allow you to achieve brilliant quality on everyday offset coated media. Easily. 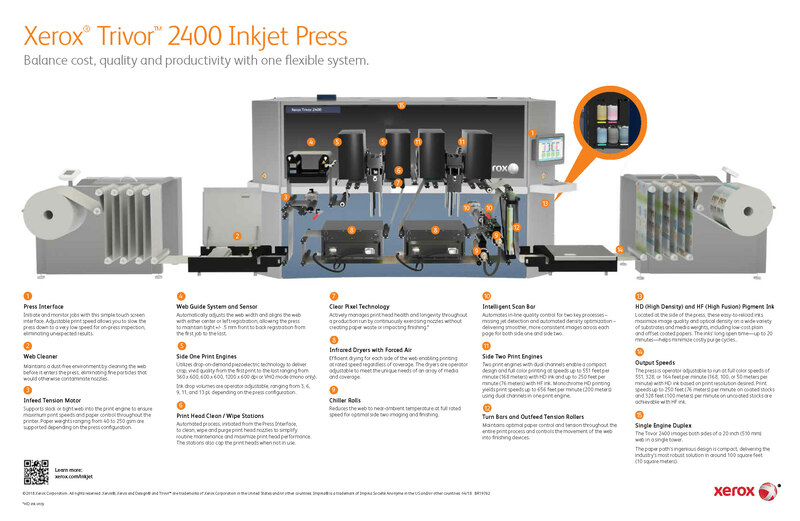 With a ‘wow’ factor that was previously unachievable with inkjet, these inks let you migrate high-value applications to the Xerox® Trivor® 2400 Press without sacrificing quality. Print Direct To Paper On Offset Coated Stocks. When you can print directly on the papers you use for offset jobs today – without any intermediary treatments or precoating – you reduce complexity in a number of ways. High Fusion Inks are formulated to deliver less moisture to the paper, simplifying the drying process and reducing related energy consumption. And without the need for special paper or extra dryer, coater, and primer modules, your savings will add up. Simplify your supply chain by printing directly on the offset coated papers you’re running today. Migrate static offset jobs for quicker turnaround. Add personalization to boost effectiveness and relevancy. Run high-volume digital color jobs more cost-effectively. The Trivor 2400 couples game-changing inks with proven Impika® print head technologies and new automation capabilities to make image quality consistently excellent. Together, these technologies ensure that you spend less time maintaining the press and more time running.